This species was not even mentioned in our First Atlas as there had never been any hint of its presence in the breeding season in the county. It was a bird of Scotland and northern England, first recorded breeding in Northumbria in 1941 and Cumbria in 1950. 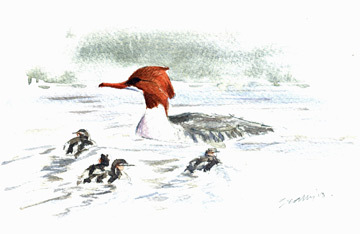 The national BTO Second Atlas, with fieldwork in 1988-91, showed that Goosanders had spread greatly since the BTO First Atlas (1968-72) and they have been converging on Cheshire from all sides. To the west, the Welsh population rose rapidly from one pair in 1968-72 to 10 pairs by 1977 and 100 pairs by 1985, and they spread over the English border to Shropshire in 1987. In the Pennines they had reached Lancashire by 1973 and first bred in Derbyshire in 1981. In the context of this speedy expansion of range, it was perhaps a surprise that the first breeding in Cheshire was not until 1995, when a nest with eggs was found in a hollow tree in the east of the county (Higginbotham 1995). According to the county bird reports, the same site was occupied in 1996 and 1997, then a pair was present, but with no confirmed breeding, in 1998 to 2000, and no indication of breeding at all in 2001. In 2002 unfledged juveniles were noted on the River Dane, Congleton, in late May and in 2003 ‘the usual records came from the River Dane during the breeding season with a female and four chicks on the river by the Macclesfield Canal aqueduct (SJ96C)’. This Atlas spurred more recording. Although no confirmed breeding was reported in 2004, pairs were found on two more river systems, the Dee on the Welsh border and the Weaver in central Cheshire. Goosanders were not proven to breed on the River Weaver, but a pair was present near Stapeley (SJ64U) for about two weeks in the breeding season of 2006, frequently visiting an old poplar tree alongside the river, with the female seen entering a hole. Birds were proven breeding on the Dane in SJ76Y in 2005, and in SJ76N and SJ96C in 2006, and on the Dee near Crewe-by-Farndon (SJ45G) in 2006. In all four tetrads, surveyors found a female with a brood of chicks, a delightful experience whose effect was nicely summarised by Ann Pym: “Fantastic!! Observed a female swimming with 11 young, quite well grown. In next few weeks saw three more times.” Young chicks eat aquatic invertebrates, graduating to small fish as they grow. They are tended alone by the female; as soon as their mates are incubating eggs, the drakes migrate to moult in northern Norway, not returning until November (Migration Atlas). The county population is only 4 pairs confirmed and 10 pairs probably breeding, but with birds on three of Cheshire’s river systems the Goosander seems firmly established as a breeding species. In other parts of Britain Goosanders have been encouraged by provision of nest-boxes, and discouraged by illegal shooting by anglers, but neither is know to have occurred in Cheshire.